The conservative watchdog organization Judicial Watch has obtained bombshell new documents by suing the federal government. The documents show that the Obama Administration [including Hillary Clinton] knew about ISIS plans to establish a caliphate in Iraq before the 2012 election and knew days before the deadly attacks in Sept. 2012 that weapons were being shipped from Benghazi to Syria. 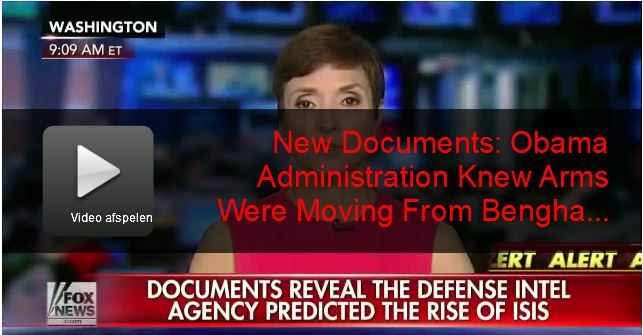 CATHERINE HERRIDGE, FOX NEWS CHIEF INTEL CORRESPONDENT: Newly released documents show a serious disconnect between what the administration said and what was known in the Defense Intelligence Agency (DIA). This Sept. 16, 2012 memo copied to the National Security Council, the CIA, the State Dept. and others, concluded the Benghazi terror attack was planned at least ten days prior in advance. The DIA memo also reports the attack was tied to 9/11 [11th anniversary] and was retaliation for a 2012 drone strike that killed an al-Qaeda strategist. There is no discussion of a demonstration or an anti-Islam video. Obama, pack it up and leave.